La Mirada, CA – Makita® U.S.A., Inc. has expanded the world’s largest 18V lithium-ion cordless tool platform with the 18V LXT® Lithium-Ion 6.0Ah battery (model BL1860B). The new battery is engineered more run time (twice the run time of the Makita 3.0Ah LXT® battery), but with the same weight and dimensions as the lower-capacity 3.0Ah, 4.0Ah, and 5.0Ah LXT® batteries. It reaches a full charge in only 55 minutes, the fastest charge time in its category. For added convenience, it has an on-board L.E.D. charge level indicator. Users will also benefit from expansive breadth-of-line: the new BL1860B is compatible with over 150 Makita 18V cordless solutions, the world’s largest 18V lithium-ion cordless tool line-up. The new 6.0Ah battery will set new standards in run time, particularly when used on efficient brushless motor tools or in tandem on select Makita “X2” tools. Makita 18V X2 LXT® (36V) cordless tools are powered by two 18V batteries, and are engineered to deliver corded power and run time for select highest-demand tools like saws, blowers and trimmers – but without leaving the 18V battery platform or investing in heavier, high-voltage batteries. For improved tool performance and extended battery life, Makita created Star Protection Computer Controls™. Star Protection is communication technology that allows the Star Protection-equipped tool and battery to exchange data in real time and monitor conditions during use to protect against overloading, over-discharging and overheating. Makita LXT® batteries equipped with Star Protection, including the new BL1860, ensure added protection when used with an LXT® tool also equipped with Star Protection. Makita 18V Lithium-Ion batteries deliver consistent power and run time in extreme temperatures, even in winter (-4°F/-20°C). The impact-resistant outer case and shock-absorbing inner-liner are engineered to protect the battery, and each battery has sixteen contact terminals to maintain a constant connection with the tool to help prevent power loss or fluctuation, even during high-vibration applications. The Makita Rapid Optimum Charger (sold separately) is a smart-charging system that communicates with the battery during the charging process to monitor current, voltage and temperature. This advanced charging technology helps optimize battery life and deliver a faster charge. In addition, the Charger has a built-in fan to cool the battery for faster and more efficient charging, even in hot weather conditions. Makita® is a worldwide manufacturer of industrial quality power tools and outdoor power equipment, and offers a wide range of industrial accessories. Makita utilizes leading-edge technology and innovation to engineer tools that are more compact with less weight yet deliver industrial power and results. Makita's extensive line of cordless lithium-ion tools includes 18V LXT® Brushless Lithium-Ion, 18V Compact Lithium-Ion, and 12V max Lithium-Ion. Other best-in-class products include rotary and demolition hammers and saws equipped with Anti-Vibration Technology (AVT®), MM4® 4-Stroke engine power equipment, Super Joint System - SJS® grinders, miter saws engineered with Deep and Exact Cutting Technology (DXT®), Impact GOLD®, the New Gold Standard in Impact Driving, and more. Makita U.S.A., Inc. is located in La Mirada, California, and operates an extensive distribution network located throughout the U.S. For more information, call 800/4-MAKITA (800/462-5482) or go to makitatools.com. Follow Makita on Facebook, Twitter and Instagram @MakitaTools and on You Tube @MakitaPowerTools. The MAKITA TEAL COLOR is the trade dress of Makita Corporation and is protected under common law and registered with the U.S. Patent and Trademark Office. The Makita Black & White color combination is the trade dress of Makita Corporation and is protected under common laws and registered with the U.S. Patent and Trademark Office. 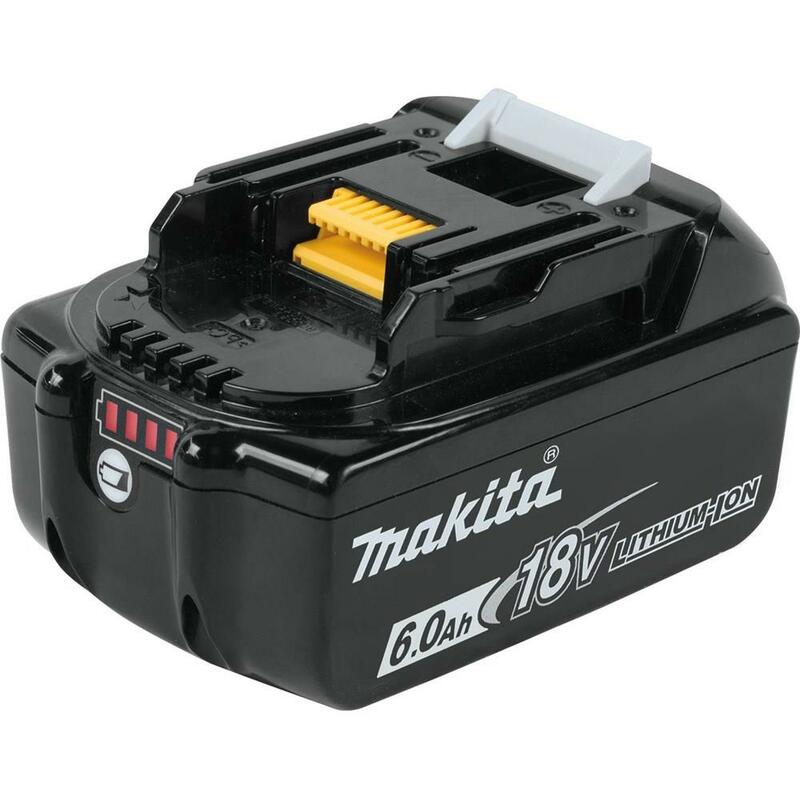 The new 6Ah battery is compatible with over 150 Makita 18V cordless solutions. Makita offers the world’s largest 18V lithium-ion cordless tool line-up. Users will benefit from longer run time, especially when using new 6.0Ah batteries on Makita “X2” tools (including the 18V X2 LXT® 36V Brushless Recipro Saw (model XRJ06Z, sold separately). For added convenience, the BL1860B has an L.E.D. charge level indicator.